In addition to Team Skull, there is also yet another organization found in Alola: the Aether Foundation. Their goal is to provide a place of refuge for Pokemon from Team Skull's antics, at least that's the perception they try give within the beginning. As the storyline unfolds, Aether will actually get join efforts with Team Skull. 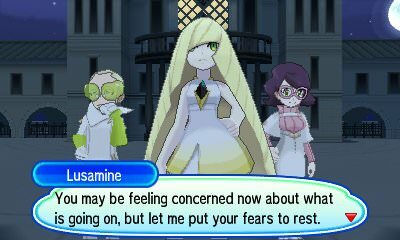 This is mainly in part to Lusamine, the President of Aether, and her selfish desire of defeating Necrozma all by herself. Encounter 1 - Game Intro: You first get a glimpse of the Aether Foundation during the intro to the game, where Lillie is seen running from employees after having taken Cosmog. The cut-scene ends with Cosmog creating a portal for it and Lillie to escape. Encounter 2 - Diglett Tunnel: The first real encounter your player will have with Aether is in Diglett Tunnel. They will merely tell you how Team Skull has been riling up Pokemon, and how they often interfere with Pokemon and their trainers. Encounter 3 - Memorial Hill: The next time you find Aether will be in Memorial Hill, where one of their Admins is arguing with a few Team Skull Member over a stolen Slowpoke. You will end up battling Team Skull, and after defeating them, Aether will suggest you to go to Hano Grand Resort to talk with them after your Akala Island Grand Trial. Encounter 4 - Hano Grand Resort: Once your reach the Grand Resort Hotel, the Aether Admin will introduce himself as Faba. He will then invite you to come to Aether Paradise with Hau, a special island the Aether Foundation built in the middle of The Alola Region. Encounter 5 - Aether Paradise: After arriving to Aether Paradise, you will be given a tour by Wicke, ultimately ending by you finding and meeting the President of Aether, Lusamine. Lusamine seems to be all about protecting Pokemon from Team Skull, having built this island for Pokemon to escape their evil ways, loving Pokemon enough to do this very thing. After meeting her, an Ultra Beast will appear through a Wormhole, the same creature you must defeat in battle. After doing so, you will learn that Lusamina is teaming with the Ultra Recon Squad in case Necrozma should break from captivity and threaten the region. Encounter 6 - Ula'ula Meadow: On your way to Po Town, you will discover Faba once more in Ula'ula Meadow. After questioning why you are there, he will mention how he has taken the initiative to check on the Pokemon of this given area. He will then note how the Aether Foundation is considering taking care of Necrozma all on their own. He will leave by asking you if you personally think his acts are worthy of being a president. Encounter 7 - Return To Aether Paradise: After discovering Lillie has been taken by Team Skull, you will head to Aether Paradise with Gladion and Hau in hopes of finding her. As the story unfolds and you battle the waves of Aether Employees that stand before you, you will discover that Lillie and Gladion are the children of Lusamine, and that Lusamine has sought the help of Team Skull to kidnap Lillie in hopes of retrieving Cosmog. She hopes to use Cosmog's power to open a Wormhole - even if that means it kills Cosmog in the process - looking to enter Ultra Space to defeat Necrozma on her own and save the Pokemon she loves so much. Even though she doesn't kill Cosmog in the process, she does accomplish her goal of reaching Ultra Space. Encounter 8 - Altar of the Sunne: After Cosmog evolves into the Legendary Pokemon you were searching for, both Lusamine and Guzma will be sent back through a Wormhole at the hand of Necrozma. With Lusamine's plan having failed, Necrozma will fuse with the Legendary Pokemon and it will then be up to you to defeat Necrozma not once but twice. After defeating Ultra Necrozma, Lillie and Lusamine will Return To Aether Paradise in order to aid the weak Legendary Pokemon. Encounter 9 - Poni Grove: After defeating the Pokemon League and then assisting the Ultra Recon Squad in Poni Grove, Wicke will appear and give you the Type: Null (along with all of its Memory Drives) that Gladion wanted you to have (since he has taken off for the Kanto Region). Encounter 10 - RR Episode: During the RR Episode, Team Rainbow Rocket will take over Aether Paradise in hopes gaining control over this universe. Not only will Faba change forces and try to aid Team Rainbow Rocket, but Giovanni will also kidnap Lusamine in hopes of turning her into one of his followers. Enounter 11 - Aether Paradise: After defeating Team Rainbow Rocket, things at Aether Paradise will return to normal. You can return to challenge Faba to a battle, with him insisting he has changed (though he still has aspirations of being President). Encounter 12 - Pokemon League: Should you rematch the Pokemon League on the first day of any month after defeating the RR Episode, there is a chance that Lusamine will be your final challenger. She will thank you for always looking out for Lillie, as well as saving The Alola Region from Necrozma. Encounter 13 - Aether Paradise: After defeating Gladion as a challenger to your championship at the Pokemon League, you can Return To Aether Paradise to see the encounter Lusamine has with her husband, Mohn. He still has no memory of their lives together, and she doesn't mention anything about it since he looks to be happy with where he is at.